United Philanthropy Forum’s first-ever 2017 Compensation & Benefits for Philanthropy-Serving Organizations report provides comprehensive benchmarking data and analyses on the employment practices of regional and national philanthropy-serving organizations (PSOs), based on the responses of 50 PSOs. PSOs are more diverse than foundations but less diverse than the country. 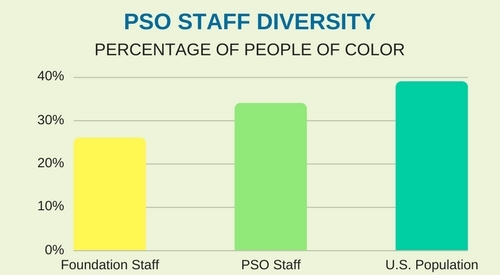 66% of PSO staff are white, compared to 74% for U.S. foundations, indicating that PSO staff are more racially and ethnically diverse than the field they serve. However, this figure is higher than the 61% of the U.S. population that are white, suggesting that PSOs need to make additional progress to reflect the full diversity of the country. The need for diversity is even greater at the CEO level, where 78% of CEOs of PSOs are white (although this remains well below the 90% share reported for foundation CEOs and nonprofit CEOs nationwide). PSOs are predominately female. 76% of PSO staff positions are held by women. This share is identical to the percentage of women among foundation staff nationwide. Among the CEOs of regional PSOs, women also accounted for a similar share of positions (78%). However, among national PSOs, men accounted for half of all CEO positions. PSOs are experiencing staff growth. 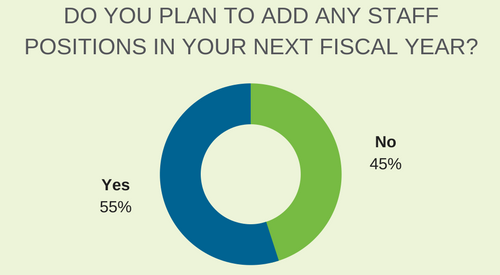 A majority of PSOs (55%) plan to add at least one staff position in their next fiscal year, which is nearly identical to the 57% of all U.S. nonprofits that expected to create new staff positions in 2016. Most PSOs had staff turnover in the past year but see steady turnover levels. 75% of PSOs experienced at least one staff transition in their last fiscal year, but they appear to view their rate of turnover as remaining fairly constant. Compared to two years ago, a majority of PSO respondents (57%) consider their rate of turnover to be at about the same level and just 15% perceive it as being higher. This is consistent with trends for the nonprofit sector as a whole, where turnover rates have remained fairly steady over the past few years. Most PSOs report positive experiences in recruiting new staff. Among PSOs that have recruited for a senior- or junior-level staff position in the past two years, nearly three-quarters rate their experience as “extremely” or “generally” positive. Forum President & CEO David Biemesderfer shares reflections on some key findings from the report. Note: This report is a companion report to the Forum's “Key Metrics” report on PSOs' governance, finances, membership, services and programs, and operations, based on additional learnings from the survey.